Bengalis(Indians native to Eastern part of India) are known for their sweetness in allover India. I am a Bengali and yes I can vouch for this. We can be sweet in many ways, first of all we love sweets, secondly we speak the sweetest language of the earth, Bangla (I am not saying, all non-speaking bengalis say this) and we are the sweetest host if we have a planned or even a sudden guest visit. Bengalis offer their level best, even more to their capabilities to their guests. Outside Bengal, bengali cuisine is always summed up either by Aloo posto(potatoes cooked with poppy seeds or Misti Doi which literally means the sweet yogurt. And I am proud of that. Definitely, this chilled sweetened yogurt is just divine. The red hue from the caramelization of sugar makes it more attractive and irresistible. 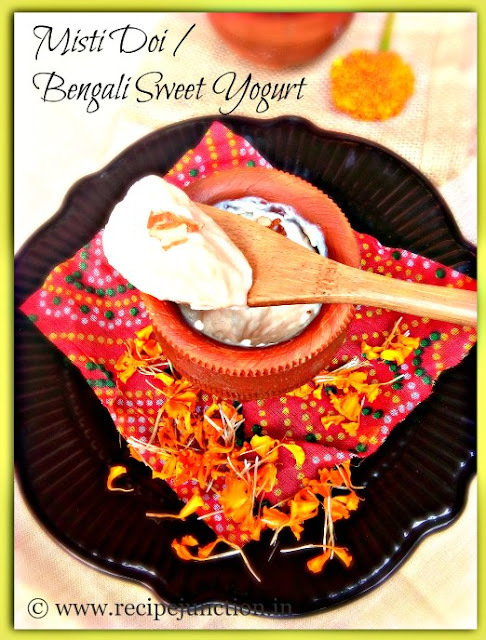 It is the most beloved sweet/dessert of bengal and no other regional cuisine of India has this sort of sweet yogurt in their cuisine. Yes, bengalis has experimented enough with this humble yogurt in many ways, during mango season Aam Doi or mango yogurt, chocolate yogurt and so on. The biggest festival of Bengalis, Durga Puja is just around the corner, in just 3 weeks. The preperation of this festival is going on in its full form everywhere in my state now. From making the idols, shopping for new clothes, building the pandals for the pujas in every nook and corner of the city, lighting up the roads, there is a festive atmosphere all around. 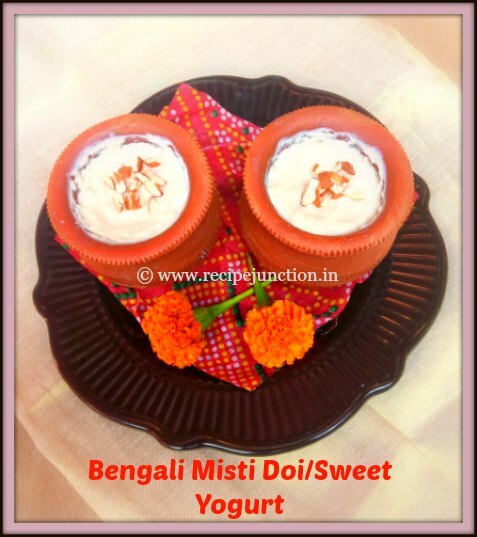 As a blogger, while checking my recipe list, I found that I havn't posted the most beloved sweet of Bengal, Misti Doi yet in my blog. 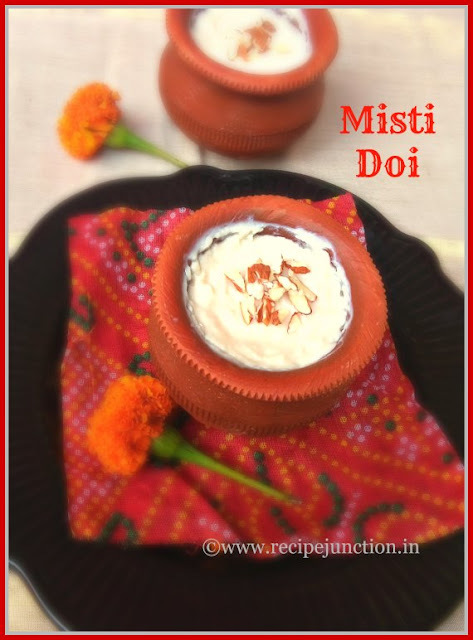 At the same time, my foodie group, Kolkata Food Bloggers has also announced an event, "Festive Desserts" for this week where we have to post a festive dessert and I took this opportunity to post my Misti Doi recipe for the event. The traditional way of making this dessert is a bit time-consuming. As I said before, the beautiful pinkish-red color of misti doi which we get by caramelizing the full-fat milk with sugar. Full-fat milk is first thickened and cooled. Then the milk is set to ferment overnight in an earthen pot along with some fresh non-sweetened yogurt added to it which works as culture for fermenting. Earthen pots are traditionally used to set this yogurt as it brings the right temperature for fermentation. While growing up in the Bengal, I never tried to make this at home, as we could get it anytime we wanted from nearby sweet-shop. But during my living outside India, I had to make this at home whenever we had cravings for this. But there is always a short-cut method of every recipe for busy people and there is a baked version of Misti Doi also available which brings out the perfect color, taste and texture of this superbly delicious dessert. So whenever my family demanded some misti doi I opted for this recipe and it never disappointed me and I served chilled perfectly sweetened misti doi to my family. 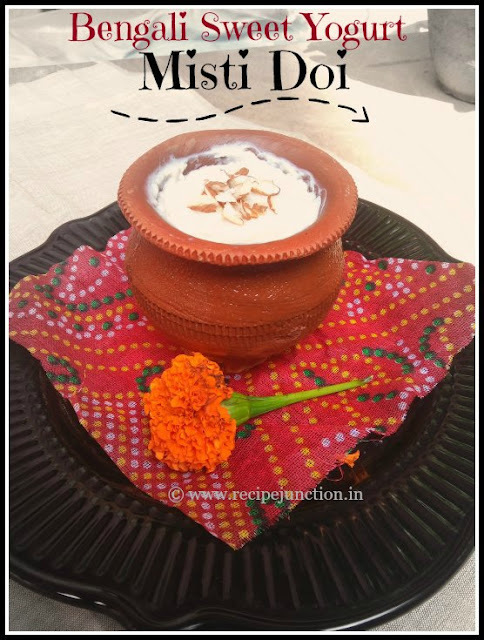 Today I'm sharing this easy-pesey baked version of making Misti Doi with you all too. Try it at home and let me know the result. In a bowl, mix everything and give a good stir. Then in an oven-safe bowl, pour the mixture. Condensed milk is added here for the sweetness. You can use the whole tin of condensed milk or add as much according to your taste, how much sweet you want. I usually use 3/4 of 1 tin. By using condensed milk, you will also get the light reddish color, what bengali Misti Doi has. If you don't get evaporated milk, then just thicken some milk to half of its original quantity, similar to the quantity mentioned in the ingredients list and add in there. Pre-heat oven in 170 degree C/ 340 degreeF. Cover the bowl with an aluminium foil and put the bowl inside oven in lower level of your oven. I like to make it in low heat for longer time, it sets very good. It will take about 1 and 1/2 hour or so. When yogurt is set well, remove from oven. Take out and let it cool in room temperature. Then refrigerate for 2-3 hours before serving. It well set some more after chilling. 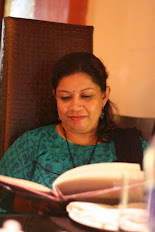 ongoing Event, "Festive Dessert", the theme is the brainchild of my fellow group member and blogger, Sarani Tarafder who blogs from "Back to Basics.." and she is our featured blogger of the week. 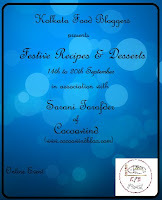 Visit her blog for very innovative and healthy recipes and also visit our Facebook page for more such Festive Dessert.